I'm almost finished knitting my log cabin shawl. I'm close enough to being done that I'm allowing myself to think about the next project. And by 'next project,' I mean three things that I'm having trouble prioritizing. 2. A big, giant, beaded Pi shawl knit from Glazed Carrot Malabrigo lace weight wool. This is the one I really, really want to knit but... A beaded Pi shawl? First, when would I ever wear a giant, bright orange, beaded Pi shawl? And second, am I crazy? A beaded Pi shawl? I probably won't live long enough to finish knitting it. And third, I haven't found a Pi shawl pattern that screams 'Bead me!" 3. Last, but not least, and certainly most needed, is a pair of socks. But there's that whole dpn thing. And please, don't mention Magic Looping them. Magic Looping anything makes me want to poke my eyes out. I constantly pull the wrong needle and loose all my stitches, plus for some reason, it bothers the old carpal tunnel. But despite the current non-excitement over a dpn project, I really want to knit the socks. First, I desperately need more socks. I haven't knit myself a pair in years (let's disregard the pair still awaiting Kitchenering.) And since I tend to walk down the driveway in my sock feet to get the mail.... I tend to wear out my socks fairly quickly. Second, my daughter picked out the yarn. It's Patons Kroy Socks in the Bramble Stripes colorway. Every time we go to the big box craft store, (which seems to be weekly - that apple didn't fall far from the tree!) and I take a spin down the yarn aisle, Sarah picks up this colorway and says she likes it. And I'm always surprised because it's green and brown and white and looks like it may turn out to be sort camouflage-ish. But Sarah is determined it's very Slytherin. 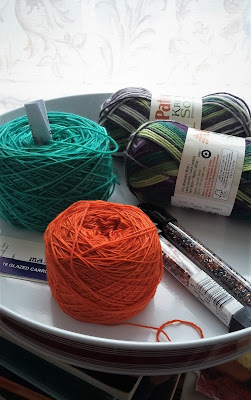 So the last time we were at the big box craft store, the yarn happened to be on sale so I bought some. Except they only had two skeins left and .... You guessed it - they are different dye lots. Same yarn, but very visually different. According to Sarah, the second skein is very Hulk-ish and she thinks Slytherin vs the Hulk would be pretty cool. And Third (it is Three on Thursday!) I'm pretty curious to see how different the two skeins knit up. So, mismatched socks it is. Or at least, it will be. Eventually. Join me for the Three on Thursday link-up. 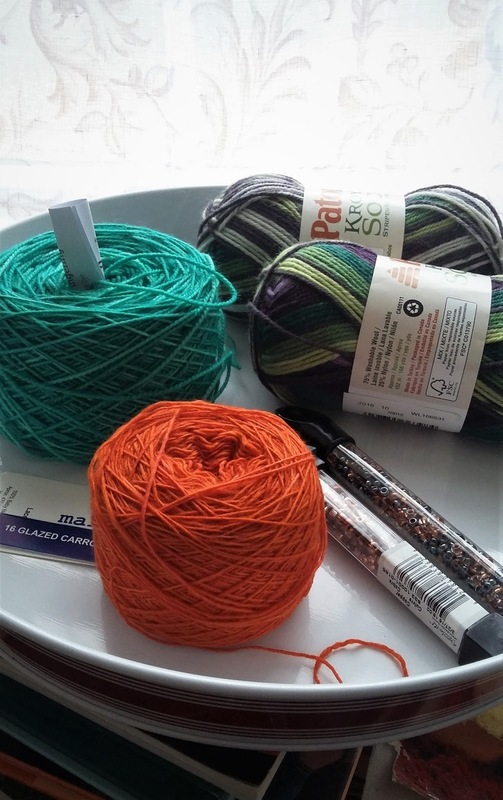 Okay ... here comes the "talk you down" ..... do you really want to waste that beautiful orange yarn on something you won't wear??? Mismatched socks sound like fun. No need to fuss about making them exactly the same. Mismatched socks are The Thing now, so your new socks will be very On Trend! Using dpns are a barrier for me. Can you knit mitts using magic loop? I hate magic loop too. Sorry I used those words - I am a die hard double pointed needle fan through and through. Wooden. I use metal for all my circs but wooden for sock knitting - my hands tend to relax in the grip with wood! Wooden dpns - the Only way to knit socks! If you decide to do a beaded pi shawl, I will support you. However, I will also discourage you to think twice. Talk about a forever project! And I'm not convinced they are very wearable. So sorry that you don't like DPNs. I love love love them! Even though I have issues with ladders. I would like to learn Magic Loop one of these days. Pat me on the back!